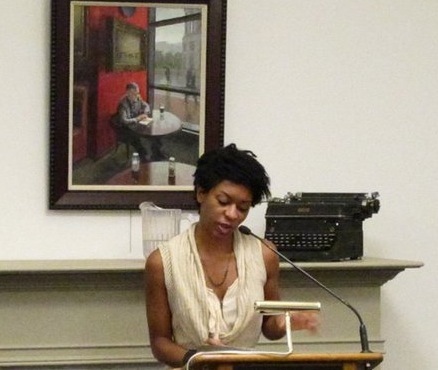 Listen to a sneak peak of our 10/26 headliner Camille Rankine reading her poem, “Symptoms of Island”! It is always fascinating to hear poetry read aloud (it fascinates me because I don’t/won’t do it – I won’t read my poems aloud, I leave it to other people). What impresses me hear is Camille Rankine’s attention to each syllable. The poem is full of unexpected shifts of grammar, word-choice, place, and image, and her own delivery is very crisp, as though every word was equally important.